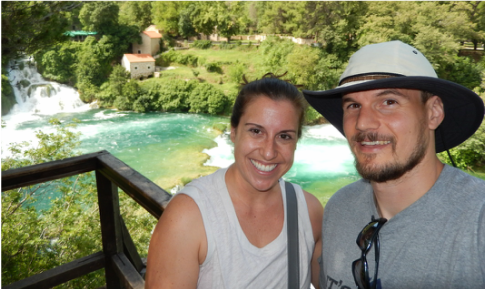 Picture from our Honeymoon in 2016 at Krka National park, Croatia. The Karst topography results in beautiful waterfalls formed over thousands of years. My name is Eastman Phenix Landry and I am a High School Physics Teacher. I believe the classroom is one of the most amazing environments in the world because its purpose is never for personal gain but rather personal empowerment through the pursuit of knowledge and healthy social interaction. I cannot express how excited I am to be teaching at the Kinder High School for the Performing and Visual Arts. I graduated from Rice University in 2009 with a B.S. in Mechanical Engineering. Upon graduating I taught IPC at Austin High School in HISD for a year before I moved to HSPVA where I teach Physics. I got married in January, 2016 and am fortunate to have the love of my life working just down the hall from me for Kinder HSPVA's senior capstone course. We were also blessed in the spring of 2018 to welcome our baby girl, Evelyn, into our lives and soon afterwards I finished my Master's in Education degree with a focus in Curriculum and Instruction from the University of Houston. Growing up I lived in Bryan, TX; Lakeland, FL; Madison, WI; Nashville, TN; Del Mar, CA; and Austin, TX where my family still resides. I have an older brother and two younger sisters. My interests include travel, hiking, cooking, running, juggling and physics. The 2018 - 2019 school year will be my 10th year of teaching but I am still learning each and every single day along the way.